Any patient with clinically organ confined prostate cancer, who is a candidate for definitive therapy, should be considered for a robotic radical prostatectomy. Any patient with clinically organ-confined prostate cancer, who is a candidate for definitive therapy, should be considered for a robotic radical prostatectomy. TABLE 1 ■ Vattikuti Institute of a contraindication, but rather may be a good reason to consider the robotic approach. Prostatectomy Key Steps At our institution, approximately 30% of patients have had major intra-abdominal sur gery, including a Whipple procedure and hemicolectomy, and none have required conversion to an open procedure. Also, a Vattikuti Institute of Prostatectomy has been performed on patients with previous abdominal radiation, as well as, salvage prostatectomies after external beam radiation therapy or radioactive seed implantation. 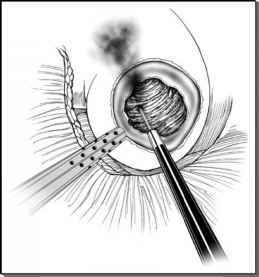 Often patients require lysis of adhesions to varying degrees, either during or after port placement. An alternative surgical approach, such as an open or perineal prostatectomy, may be more appropriate for patients with multiple or extensive abdominal or pelvic surgeries. While patient habitus is a consideration, morbid obesity is not a contraindication, but can make the dissection more challenging. We have performed the operation in patients with body mass indexes up to 39, but prefer patients with body mass indexes below 30. Furthermore, excessively large prostates are not prohibitive. Ideal prostate size ranges from 30 to 80 g; however, the Vattikuti Institute of Prostatectomy procedure has been successfully performed on glands greater than 200 g. A prominent median lobe or significantly enlarged lateral lobes will impact the bladder neck dissection but is not a contraindication. More importantly, if pelvic dimensions are small relative to the size of the prostate, then the dissection may be more difficult. It is exactly in these circumstances the robot provides excellent visualization in a narrow space and facilitates a more precise dissection.